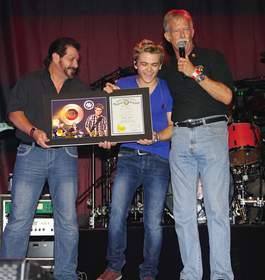 NASHVILLE, TN--(Marketwire - Sep 10, 2012) - Atlantic recording artist and Breaux Bridge native Hunter Hayes became the youngest inductee to ever join the Louisiana Music Hall of Fame on September 7. Hayes was presented the plaque at his Oschner Pediatrics benefit concert by the president of the Louisiana Music Hall of Fame, Mike Shephard, and renowned Cajun artist Jo-El Sonier. In honor of his 21st birthday, Sonier also led the crowd of fans in a very loud rendition of "Happy Birthday." Hayes continued to celebrate his milestone 21st by singing the National Anthem at the New Orleans Saints' football game against the Washington Redskins on Sunday. Hunter Hayes, the multi-talented writer, musician, producer, and performer, is the only country artist to play every instrument, write/co-write every song, and co-produce his critically acclaimed self-titled debut album. As both the 2012 CMA and ACM New Artist of the Year nominee, Hunter has been touring and performing live for decades. He has played to sold out venues across the US and Canada on his MOST WANTED headline tour and is currently putting the finishing touches on preparations for touring with Carrie Underwood on her "Blown Away Tour" this fall. The Louisiana native has also shared the stage with Taylor Swift, Rascal Flatts, Keith Urban, Lady Antebellum, Trace Adkins, Brad Paisley, and Hank Williams, Jr. This multi-instrumentalist continues to garner praise from fans and critics alike as he made his world-premiere national television debut on CBS' Late Show with David Letterman and also performed with The Roots on Late Night with Jimmy Fallon and on Good Morning America. His current hit "Wanted" was recently certified Platinum by the RIAA. For more information on Hunter Hayes, please visit www.HunterHayes.com.